Rock is dead. Certainly if you listen to the charts (and does anyone actually do that anymore?) that literally sounds the case. Thankfully there are some dedicate rockers willing to give the genre mouth to mouth, in an attempt to revive this deceased genre and keep it ticking over that little bit longer. 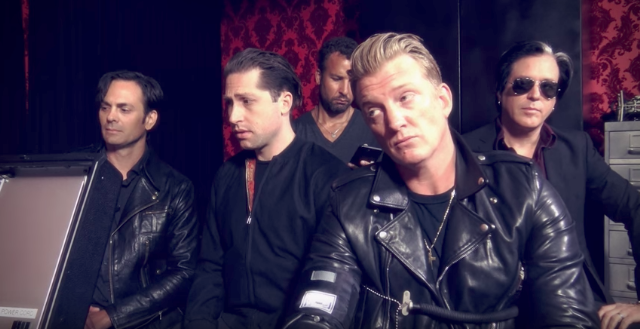 Enter stage left: QotSA. 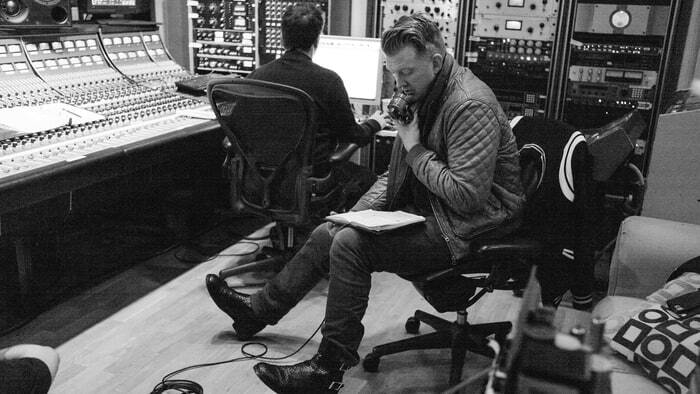 Front man Josh Homme and the rest of the band have been dishing out their brand of delicious rock since 1996 and it still sounds as fresh today. Villains is their seventh studio album, and finds the band in a joyously rocky mood. There’s something eerily ominous surrounding the beginning of the first track ‘Feet Don’t Fail Me’; it grows like a soundtrack to an eighties sci-fi flick, before some guitars eventually bully their way into the picture. At times Homme’s vocals have a David Bowie quality; part parody, part tribute act. Meanwhile some keyboards soar with an electro styley, complimenting the guitars rather nicely. The pace is immediately picked up with the arrival of ‘The Way You Used to Do’ with its frenetic start. Guitars buzz around like annoying bees, flitting from one ear to the next, as Homme delivers his sharp lyrics. It’s adrenaline fuelled and never lets up. That synth, Blade Runner-esque theme continues with the intro to ‘Domesticated Animals’. It soon gives way to a melodious beat, with drums and bass making their presence felt. It’s a dark and chilling slice of rock that lives with you long after it has finished. It’s also loud without being busy. Nice that. There’s almost a jaunty mood to ‘Fortress’ once it gets going. Homme uses his voice to good effect, as it winds gently through a welcome soundscape. A rock song that doesn’t feel the need to push too hard. The same can’t be said for ‘Head Like a Haunted House’, which just can’t wait to get off the blocks, speeding out like a freight train, so it does. The band throw a lot into it, swirling around in the QotSO’s very own blender. It’s so breathtakingly chaotic that it could really put the fear in you if you let it. Once again with the synth intro, 'Un-Reborn Again' plods onto the scene, heavy underfoot. The driving force, as you would expect, is a grubby guitar riff that haunts the song throughout, punctuated by electro keyboard strikes. It has that darker edge that the band so often bring with them, for which we should be forever grateful. Homme comes out this time with softer vocals for 'Hideaway'. This time though, the band lay in wait, undecided whether to go all full throttle on his arse or not. It turns out they hold back just enough, letting this track go further and further out of their range. What remains is a pleasant experience, that is inoffensive in almost every way. The band turn it up a notch or three with 'The Evil Has Landed'. The synths have been buried six feet under with wild riffs dancing all over their grave. At one point Homme "woo hoos" all over it (because he can) while a guitar has echoes of early Radiohead can be heard doing its thing. And then another guitar offensive, going up a significant gear, takes it to a satisfying conclusion. With a mournful start, Homme has a siren quality to his vocals on 'Villains of Circumstance'; quiet, with a hint of menace to come. As expected, the track soon picks up the pace, galloping forward with intent. This back and forth in speed plays out throughout and works well, sending it off into the distance in style, as so the album itself. It may have something to do with safety in numbers, but this album dripping in rock isn't the only one of its kind to be recently released. Not long after, it was joined by the new Foo Fighters album, as well as a long player by new super group Prophets of Rage. Which means rock is alive and well, for a while longer at least. The overall feel of the album is no doubt helped by the Midas touch of Mark Ronson, who produced with his usual sprinkling of magic. 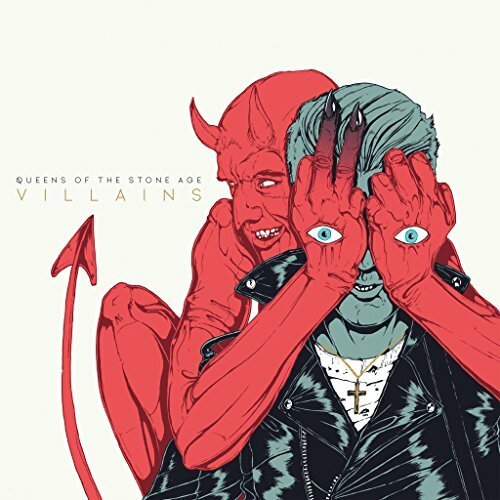 This outing for Queen's of the Stone Age is not only the kind of album you would expect, but also enjoy. Every track is accessible, containing riffs that once in your head, struggle to leave. And in a world that is currently swamped by drippy dance tunes and meaningless collaborations, Villains heroically acts as a beacon, signalling the world that rock isn't quite dead yet.